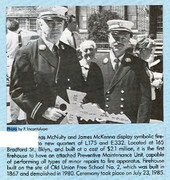 In reply #914 on page 61 CPT Tom Bonamo ENG*152 pictured as a Medal Recipient was one of my instructors in proby school as a FF detailed from R*1.....before going to SI he was the CPT of ENG*233. "Bronx is Burning" (E 82/L 31/B 27) S. Bronx 1970s - immediately follows previous video. Battalion 29 was first activated from 1898 to 1906 when it was renumbered as Battalion 39. Sixty two years later Battalion 39-2 was created and in 1969 it was renumbered as Battalion 29, essentially returning the 29 to service from part of the same battalion that had replaced it. 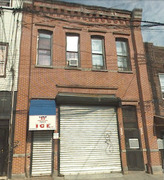 Engine 332/Ladder 175 firehouse 165 Bradford Street East New York, Brooklyn Division 15, Battalion 44 "Bradford Street" "East New York Truckin' Co."
Engine 332 was originally organized for the 1939-1940 NY Worlds Fair. It was disbanded when the Worlds Fair ended. 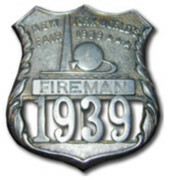 In September 1938, the FDNY 55th Battalion was formed and stationed at the Worlds Fair. Apparatus included 4 new Ahrens Fox pumpers. 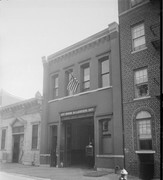 The battalion was staffed by three FDNY Battalion Chiefs, fourteen FDNY company officers, and seventy FDNY firefighters. 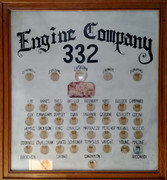 The battalion had one double engine company and two single engine companies - Engine 331, Engine 331-2, Engine 332 and Engine 333. 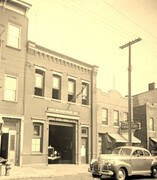 Apparatus was assigned to FDNY engine companies after the Worlds Fair closed. The battalion responded to 237 alarms. There were 166 fires, and 4 were multiple alarms. His profile fits that of most other good guys who die heroically, on the job, saving other people's lives. Fire Lieut. James W. Blackmore, 48, was a quiet, unassuming man who spent a lot of time with his family and liked to golf. He had a wife, four children, a house and, years ago, a boat. He lived a good, simple life and had a job he loved. He was a Vietnam veteran who never talked about his combat experiences, a careful man who spent many hours reading safety manuals and conducted fire drills with precision. 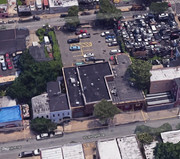 Lieutenant Blackmore died Friday night battling a five-alarm fire that consumed a city-owned, three-story apartment building in East New York. He and other firefighters fell through the second floor, which caved in after it was weakened by flames. As his fellow firefighters at Engine Company 332 and Ladder Company 175 awaited a delivery of the black bunting that would drape the Brooklyn firehouse where he was assigned, they remembered Lieutenant Blackmore as a man who was too young and too good to die. Lieutenant Blackmore's wife, Susan, said from their home in Farmingdale, N.Y., yesterday that he was born in Ozone Park, Queens, the son of Elizabeth and Robert Blackmore, who now live in Florida. He was the second of seven brothers and sisters and the only career firefighter in the family, although his father was once a volunteer firefighter. He went to several colleges but never finished his degree in education, and he served in Vietnam from 1967 to 1971, Mrs. Blackmore said. He became a firefighter 21 years ago and was cited for bravery five times, his fellow firefighters said. When he was not battling fires, Lieutenant Blackmore was playing with his children in his backyard, his family and neighbors said. He had three girls -- Sara, 13, Jackie, 11, and Claire, 9 -- and a boy, Brian, 7. Because he had a firefighter's schedule, he was home three days a week and had plenty of time to work around the house and chat with neighbors. Shortly before he died, Lieutenant Blackmore had been talking to other firefighters about the computer he had just bought for his children. Mrs. Blackmore, a nurse, said he had also been talking about returning to school to finish his degree. 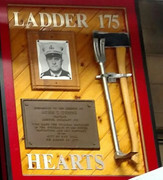 Lieutenant McGoldric said he would always remember Lieutenant Blackmore as he last saw him: sitting on a white plastic chair, smiling and surrounded by firefighters who were posing for the ladder company's annual picture. That was Wednesday, two days before Lieutenant Blackmore battled his last fire. 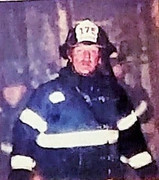 Firefighter Anthony J. Nuccio died from a WTC-related illness. 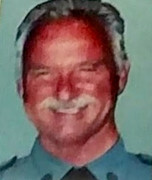 LT Thomas J. Greaney died from a WTC-related illness.